Indian Vanity Case: WE Are Featured In LOOK: Britain's Best Selling Fashion Magazine + A June Special For YOU! WE Are Featured In LOOK: Britain's Best Selling Fashion Magazine + A June Special For YOU! I say WE, because I'm representing Indian women in LOOK Magazine's International Fashion Issue- 27th May, 2013. 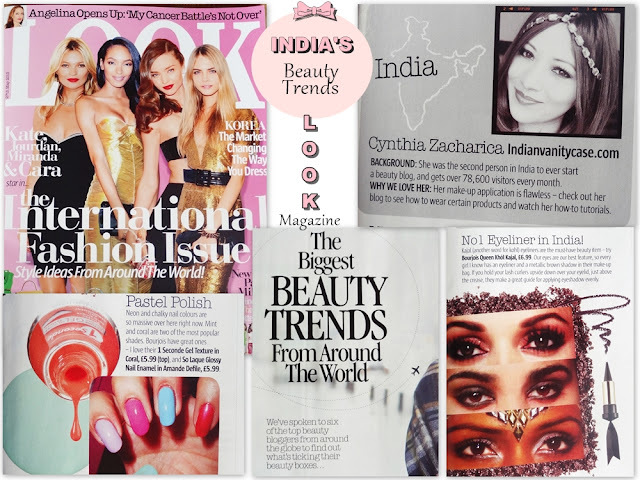 The story is all about beauty trends around the world, and I feel so proud that LOOK wanted to include India in it. A special Thank You to Look Magazine's Beauty Editor, Samantha Freedman, for that. For those who follow IVC Facebook Page , remember I asked you some questions here? Well, it was for this. LOOK gave me a bunch of questions to answer, like: Favorite Indian Celebrities, Beauty Style, Most Popular Makeup Look, etc. But, understandably, they could only pick a few for the feature. I'd like to THANK all of you who took some time out to tell me about your beauty styles. I was so overwhelmed by all the response! Please know that although I couldn't reply to all of you, I read all of your comments & emails. The 5 other beauty bloggers are from Russia, Australia, Norway, Dubai & France. LOOK Magazine: What's your favorite makeup trick? On 22nd May, I received an email from LOOK, asking for my address, so they could send me a copy of the issue. So thoughtful! Oh, you must have seen that 'Watch This Space', on the right there, for a while now. That's another thing I'm working on, and it's taking longer mainly because of my fickle-mindedness. It's just something new & fun, you'll know all about it sometime during Tutorial Month. Hope you're excited about it, and if you have any requests, feel free to jot them down in the comment box below, or Email me. Congrats :D you always awesome !! wow... thats an awesome feat. Congatulations....!!! Congrats.....made me smile!!! Keep it up!